Given the many factors and expenses that production crews must consider, it’s understandable that some components are prioritized over others. However, filmmakers and other video professionals should never overlook the importance of quality acquisition media. The solid state drive used in tandem with a high-end camera can make all the difference between a successful production and one marred by reshoots and other delays. Off-the-shelf products are unlikely to provide the full range of features needed to ensure reliable video transfer. As such, it’s crucial that crew members choose an SSD designed with professional-grade video cameras in mind. Among the many factors that DIGISTOR technicians have taken into account when creating the Professional Video Series SSD Drive is the importance of format. Video professionals who want to shoot with and get the best performance out of Blackmagic Design cameras will need an SSD that is compatible with the exFAT format. The camera and recording equipment manufacturer uses exFAT for all of its hardware, so any supplemental storage device will need to be able to run on it. This format offers a lot of advantages to those with video-editing needs, particularly if they are going to be using software on various computers. As Lifehacker’s Whitson Gordon noted, an external storage drive that is formatted to exFAT can be used on both Windows and Mac operating systems. This cross-platform functionality enables filmmakers do conduct their editing workload on numerous computers whenever needed. Because Blackmagic Design has selected exFAT as its preferred format, potential users will need SSD drives that share that compatibility. 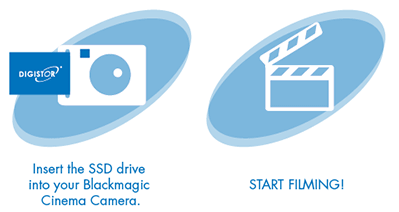 DIGISTOR Professional Video Series SSD Drives are specifically designed with exFAT in mind, ensuring that users are able to begin shooting high-quality content on their Blackmagic hardware without delay. This way, filmmakers do not need to license and launch additional software to write directly to their camera’s storage drive, dramatically streamlining the recording and editing process. When dealing with high-pressure and high-stakes video productions, crew members do not want to waste a minute on ineffective and inefficient equipment. Because DIGISTOR SSDs are certified and specifically designed for Blackmagic use, video professionals can be certain that their recording and editing hardware works as expected the first time. The functionality and reliability provided by DIGISTOR products ensure that productions are not slowed down by issues related to acquisition media. With DIGISTOR’s Professional Video Series SSD Drives, a film crew’s storage drive will always be a solution and never a problem.